"Life is absurd. We're not all perfect." 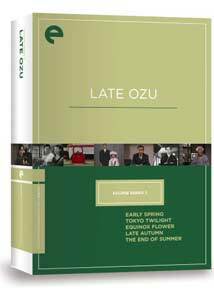 What with the sheer number of Ozu films awaiting a region 1 DVD release, it hardly came as a surprise when Criterion slotted several of them into a boxset for their Eclipse line. Gathered under the title Late Ozu, these five films begin with 1956's Early Spring through Tokyo Twilight (1957), Equinox Flower (1958), Late Autumn (1961), and End of Summer (1961). This is an excellent set in terms of the films themselves, and the prints look generally fine, but not without some problems. Extras are virtually nil as per the Eclipse model. Ozu's follow-up to Tokyo Story (1953), Early Spring leads things off, and it's a film of stasis and bitter disappointment, displaying a powerful sense of futility among the rank and file of Japanese society in regards to their lives and futures. The plot revolves around Sugiyama (Ryo Ikebe), who engages in a brief affair with co-worker Chiyo, nicknamed Goldfish (Keiko Kishi). It's not hard to see what attracts Sugiyama; Goldfish (so named because she is thought to have big eyes) is the only person in the film with vitality. Everyone else seems already beaten down and crushed by soul-sapping jobs or the absence of any real, meaningful family life. Sugiyama's wife Masako (Chikage Awashima) smiles only in spite during the film, and it's clear that she and Sugiyama have no emotional bond, despite a half-hearted agreement to re-kindle their marriage at the end of the film. The death of their only child yawns between the two like a chasm with no hope of re-connection. Likewise, the men in the film fully understand the pointlessness of their lives as salarymen, and grim-facedly await death. Ozu and co-writer Kogo Noda lay this ennui on fairly thick, but the overall effect is bitterly felt, perhaps most keenly when Goldfish and Sugiyama shake hands at his going away party. The sight of him reluctantly letting her hand slip out of his tells us all we need to know about where their feelings stand. A marvelous film. Tokyo Twilight is even grimmer, upping the ante on the usual family strife for a detour into abortion, maternal abandonment, and violent death. Here, Ozu stalwart Chishu Ryu plays Shukichi Sugiyama, a single father with two grown daughters, Takako (Setsuko Hara) and Akiko (Inoue Arima). Takako has left her boozing, bitter husband to move back in with her father, and Akiko spends much of the film searching for her deadbeat boyfriend Kenji (Masami Taura), who has impregnated her. Thrown into the mix is the missing mother, who abandoned the family when the girls were children, but has now resurfaced, to the confusion of both daughters, particularly Akiko. The tragedy that follows comes as no surprise given the doom-laden atmosphere Ozu has already set up, and the resolution, such as it is, only serves to seal at least one character's fate. Equinox Flower takes us to a more lighthearted plane, as Wataru Hirayama (Shin Saburi) proves himself a forward-thinking guy when it comes to advising other parents and children on their marital possiblities but is a hypocrite when his own daughter tries to practice what he's been preaching. The theme of the older generation being pushed aside, along with their social mores, forms the core of this film, brought home most notably by Chishu Ryu's recitation of a martial poem near the end, underlining the old way of thinking on the way out. This is also Ozu's first color film, which allows us the opportunity to watch him adapt his style to a major new tool. The lighter vein continues in Late Autumn, albeit with a bittersweet tang to it. In a reverse (or a thematic sequel) of the earlier Late Spring, Setsuko Hara, who played the daughter to be married off in the earlier film, here plays the mother who sees her daughter in a similar situation. Ayako (Yoko Tsukasa) isn't opposed to getting married, she tells her mother, she simply isn't in a rush to do so. However, the friends of her deceased father don't see it that way, working behind the scenes to get her and mother Akiko taken care of. This leads to some comedic misunderstanding and modest sexual humor, as one of the friends (Ryuji Kita), a widower himself, is picked to marry Akiko. Ozu nicely modulates the switches in tone between the humorous treatment of the three men, and the unintentionally hurtful effect it has on the relationship of the two women. Mariko Okada is notable for her performance as Ayako's boisterous friend and co-worker. In End of Summer, we turn to the Kohayagawa family, whose father (Ganjiro Nakamura) causes internal strife by reuniting with his former mistress. The company business is also suffering, and father Hanbei's children must decide which path they will follow, both as a family and individually. The potential marriage and re-marriage of two of the daughters (Hara and Tsukada again) point the way to change as the only constant, with a corporate buyout providing the family with a lifeline, but one that will end their way of life as they have known it. The ambiguous ending leaves some of the assessment of their behavior open to debate. Watching the films in a reasonably short span of time brings out a variety of thematic and story elements, allowing the viewer to see how Ozu worked like a musician in some ways, playing variations on a favored theme, except using story and characters instead. For all that, it never gets tiresome watching these films; the characters are drawn so as to lead us into their lives and understand their desires and confusions. If you've already delved into Ozu's work via previous Criterion releases or otherwise, then this set should immediately appeal, both for content and value. If you're new to Ozu, there are arguably better starting points, but this set does encompass enough facets of his work to serve as a decent introduction, but you will be left on your own in terms of background material. Here's hoping that Criterion has more in store from Ozu soon. Image Transfer Review: The films in general look okay, with the odd momentary flaw here and there; Equinox Flower has a greenish tinge to it, coupled with a lack of sharper detail, that renders it the least appealing transfer of the bunch. The optional English subtitles are clean and error-free. Audio Transfer Review: Much like the video quality, audio quality is perfectly acceptable but not remarkable. The films are dialogue heavy and as such don't overly tax anything. Extras Review: In the standard Eclipse fashion, brief essays on the reverse of the jacket art are the only extras. Another winner for the Eclipse line sees five quality Ozu films gathered for a reasonable price, with solid in unexceptional transfers. Ozu's metier was the family and its place in a changing society, a universal issue that most of us grapple with, whatever the culture.